Quarterback Carson Wentz turned in a solid performance, but he wasn’t quite as good as his 122.2 passer rating might lead you to believe. An excellent touchdown throw in the red zone on the Eagles’ opening drive was his best throw of the night. On the low end, Wentz got away with picking up a fumbled mesh and firing a pass into the arms of the Giants’ Connor Barwin, only to have the ball deflect into the hands of running back Wendell Smallwood. Philadelphia would still punt on the next play, but an interception there would’ve given the Giants possession in scoring range while the game was in reach. While they ultimately didn’t need it, the Eagles production on the ground was more due to volume than efficiency. Philadelphia didn’t surrender many opportunities for negatives plays, but they rarely managed to open up much running room for Wendell Smallwood and Corey Clement, who combined to average just 3.2 yards per carry. Philadelphia’s defensive line got after Manning pretty well, Fletcher Cox and Michael Bennett in particular. Cox tallied his fourth sack of the season, added a few more pressures, and Bennett seemed to come close to matching that production as he moved around the defensive line. The Eagles’ secondary shone in coverage and broke up several passes on the night. But their pursuit and tackling on screens and short passes didn’t match, as Malcolm Jenkins and Jalen Mills both missed multiple tackles. Eli Manning had one of his worst performances in years. He forced a handful of throws into coverage that got broken up, and flat out missed with inaccurate throws on several others. It’s just one game, but one can’t help but wonder what level of play he can consistently produce at age 37. The debate of whether Saquan Barkley was worth a second-overall draft pick will continue for some time, but he’s clearly a very special player, regardless. Barkley showed off his big play ability, with three touches that gained 45-plus yards, But ultimately, tonight’s game was the perfect example of how even one of the best running back performances of the year can only go so far in helping a team win. Before leaving the game with a biceps injury, Jason Peters had his hands full with the Giants’ Olivier Vernon, who put the veteran left tackle on skates and generated pressure on several occasions early in the game. Defensively, coverage was ultimately the Giants’ undoing, as they allowed far too many open throws and easy third-down conversions, and they didn’t force Wentz to make throws into tight coverage often enough. 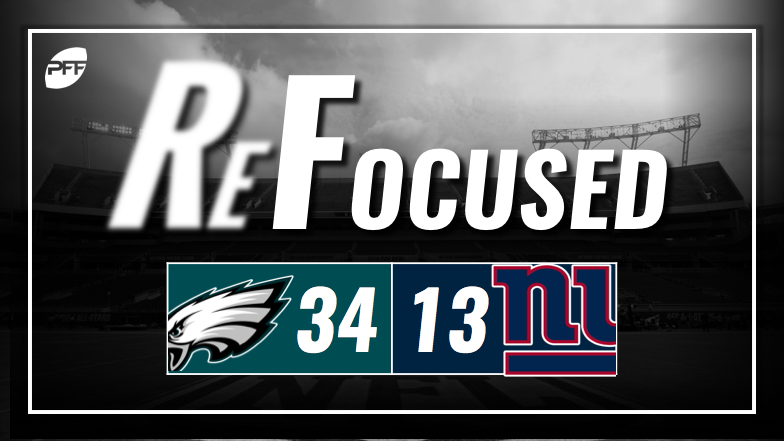 Philadelphia: Starting two first-quarter drives Giants territory and turning those into touchdowns helped the Eagles jump out to an early lead that they would never come close to relenting. New York: Saquan Barkley has lived up to the hype this year, but this game made it clear that the Giants won’t win many games without better play around him.